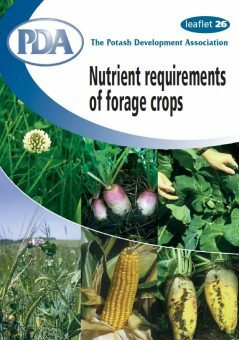 Forage crops can produce very high yields of digestible nutrients and can be a useful means of reducing overall feed costs. Achievement of high yield is an essential requirement to achieve low unit cost and depends upon good husbandry and in particular, attention to crop nutrition. Annual forage crops also offer a very useful opportunity of utilising slurry or FYM to maximum advantage without the problems of sward contamination associated with grass. A 3 year study undertaken by Kingshay Farming Trust and supported by the Potash Development Association has examined the nutritional needs and performance of a range of forage crops. The key results are reported in this leaflet. Between 30-50 t/ha of manure was applied to each plot with the aim of applying the maximum rate of 250 kg/ha of total nitrogen then permitted. The manure used contained very typical levels of nitrogen and phosphate and slightly lower than average levels of potash. The rates applied on average provided a total of 221 kg/ha of nitrogen, 124 kg/ha phosphate and 234 kg/ha potash. It must be noted that nutrient content of manure varies widely and the individual samples, measured by laboratory analysis in this study, emphasised this difficulty. In a farm situation nitrogen content can be measured fairly accurately using one of the commercially available testing kits. Between 15-25% of the total N in the manure was assumed to be available for the forage crops in the trial, depending upon time of application. Supplementary nitrogen fertiliser was applied based on site history and individual crop yield potential. Rates were varied over the 3 years and were not designed to test the optimum rate of N for the individual crops on this site. The Italian ryegrass and perennial ryegrass/white clover swards were cut 3 times in the season (4 times for the IRG in year 2) and produced excellent season yields of 13-15 t/ha dry matter. The whole-crop wheat yields of 14 t/ha DM compared favourably to the grass yields and involved only a single harvest. Good crops of kale were grown, but in the first year, considerable in-field losses were sustained at harvest which were reflected in the poorer average recovered yields compared to the other crops. The maize results relate to only a single year and represent only modest performance. The study confirmed that high yielding forage crops require very large amounts of potash to achieve maximum growth. This emphasises the importance of maintaining adequate reserves of nutrient in the soil – the aim is to maintain soils at index 2 for P and K.
The study provided useful figures for phosphate and potash removal from the field by high yielding forage crops. The basis of phosphate and potash manuring depends upon estimation of nutrient removed – see the section on basic P and K policy below. The nitrogen offtake is also shown in order to indicate the relative quantities of nutrient present in the crop. (Nitrogen removal is not a guide to the quantity of N required). It is notable that in all cases considerably more potash was removed than nitrogen. Potash removal was between 3-6 times greater than phosphate removal. It is interesting to compare the P and K offtake of the forage crops in this trial with standard published figures. The general trend in this study was for phosphate removals to be slightly lower than standard and potash removals to be higher. The standard figures for fodder beet derive from the sugar beet crop and in view of the large difference for potash, it is clear that the standard figure for fodder beet should be revised. The manure application provided a total of 234 kg/ha K2O which was sufficient potash to replace that removed in the wholecrop wheat and maize but left a deficit of 80 kg and 53 kg after the fodder beet and kale. The very large offtake of potash in the intensively cut grass resulted in a serious annual shortfall of 280-314 kg/ha of potash which would need to be made up by application of potash fertiliser each year to prevent soil reserves from being depleted rapidly. The nutrient contribution of manure should then be estimated using standard values of total content of phosphate and potash if the soil index is 2 or more and using available content if soil index is 0 or 1. 60% of total phosphate and 90% of total potash in FYM or slurry can be regarded as available. Fertilisers should be used to make-up the difference between total requirements and nutrients provided by manures. Soil analysis should be used every 4-5 years to check on any changes in soil reserves.